Hitler has been caricatured and become the subject of so much mockery that a film that actually looked at the individual from a more accurate, realistic view would always be difficult. It doesn’t help either that one of the key scenes in the whole film is then taken, adapted and used as a viral video, featuring such classic titles as “Hitler finds out his pizza will arrive late.” These videos only work though because the actor playing Hitler does such a good job. You can believe that the Hitler you watch in Downfall is as close to an impersonation of the real individual as we’ll ever get. That is down to the great performance by Bruno Ganz. From the first, almost teasing scene at the beginning of the film, you are never less than convinced that his version of Hitler is perfect. He isn’t playing a Hitler at the top of his charming, intoxicating power either, Ganz is given the task of playing Hitler during his final days, weak, slightly crazy and in a lot of ways feeble. It is an amazing performance. It also makes for the most interesting aspect of the whole film. There are so few movies about Hitler even though he is one of the most famous and intriguing characters in world history. This one tells a tale that is infamous, his final week. Locked inside a bunker, Hitler and the last few remaining, leading Nazis try to salvage what is left of The Second World War. It sees Hitler at his most desperate and also showcases the wide range of people around him, from the unwaveringly loyal to the realistic and even those caught up in his power but suddenly hit with their inevitable fate. This describes our narrator and the person’s viewpoint we see the events of the film from, Hitler’s secretary, Traudl Lunge, played by Alexandra Maria Lara. She gets a close look at Hitler’s life without being necessarily directly involved. It is through her that we get some of the more interesting scenes, from Hitler discussing how he will end it all, an over-heard tirade that confirms his growing insanity and then the witness of Hitler when he finally does commit suicide. While the film is focused on the leader of the Nazis, it is an engrossing, interesting watch. There are times when it focuses elsewhere. 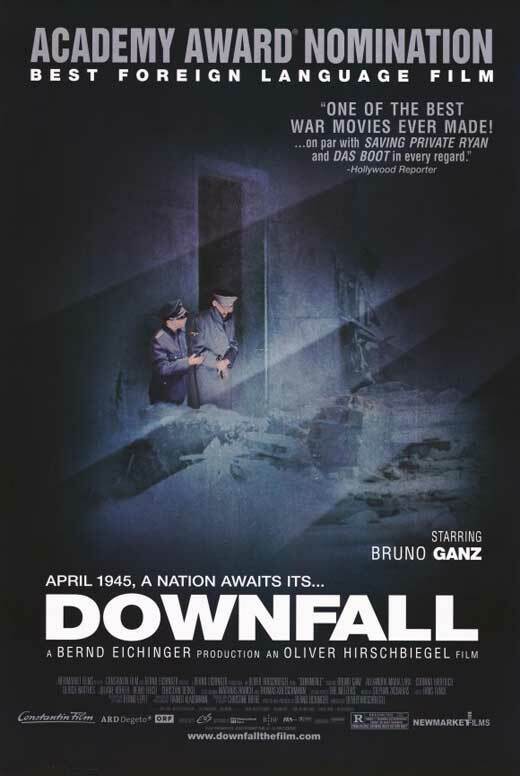 Traudl Lunge is the witness from inside the bunker but Downfall also showcases the chaos elsewhere around Berlin. Kids fighting tanks, doctors working long, almost pointless hours trying to save people and the destruction of the German capital. These scenes can be brutal but demand your attention, demonstrating the lasting effects of the leader’s actions. Not all the movie is as interesting as this though and there are moments that will test your patience. It is a long film and there feels like a lot of the story, although important and interesting, could have been removed with little effect to either the overall story or the impact of the movie. Characters get long arcs which go nowhere, other people drop in and out, having inconsequential scenes with Hitler which only serve to secure an idea of his insanity and actions that the audience will have already gathered themselves. It means that you may find yourself looking at your watch rather than at the screen as the two and half hour mark rolls by. 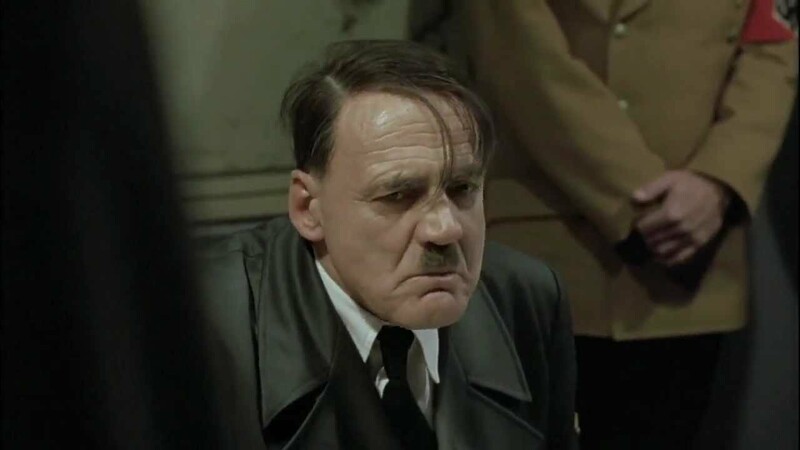 Overall, Downfall features a great portrayal of Hitler at one of the lesser known points in his life. His final days feature a Hitler at the edge of sanity and Bruno Ganz plays this part fantastically. Alongside a look at the wider implication of his actions, Downfall makes for a very interesting watch. It is bloated though and will test your patience with some of the story strands building to a long running time.